PA Chairman Mahmoud Abbas says he will hold a general referendum among his population over any final status agreement that might be reached with Israel before signing the dotted line. According to a report broadcast on the Hebrew-language Voice of Israel radio, Abbas said Monday that any agreement reached with Israel would be put to a vote before the Ramallah government would make any final deal with Israel. The announcement came after a similar one on Sunday by Israeli Prime Minister Binyamin Netanyahu in which he said he will propose a law requiring a referendum on any agreement before he signs it. 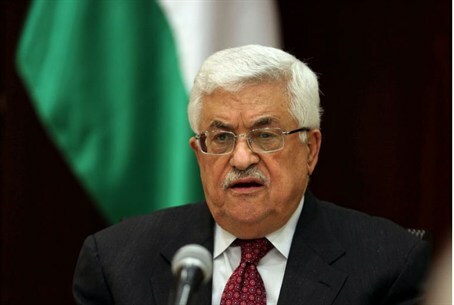 Abbas also said that the fate of renewed direct talks between the two sides are to be determined in the coming days. According to PA official Ahmed Majdalani, U.S. Secretary of State John Kerry proposed last week that talks be held for six to nine months, focusing on borders and security arrangements. Before Kerry flew to Ramallah Friday before leaving the region to pressure PA officials into returning to talks, U.S. President Barack Obama had spent time with Netanyahu on the telephone persuading him to allow Kerry to work on the PA leadership. Despite Thursday night rejections of Kerry’s proposals by the PA, on Friday by the time he left Ramallah, officials at the Muqata PA seat of government had grudgingly agreed to return to the negotiating table with Israel.